Last month, Snow+Rock Trainer Paul Farley travelled from the busy streets of London to the cliffs and caves of North Wales for two days of bouldering and trad climbing. Here’s his full report on the action, plus a few shoe, clothing and equipment recommendations for your next epic climbing trip. The first thing you notice once you get off the train at Bangor is the sheer contrast between the busy morning commute at Euston and the serene mountain landscape of North Wales. We soaked up this tranquility before driving to DMM HQ in Llanberis to meet up with Gilly from DMM, Charlie from La Sportiva, Tim from Arc’teryx and our mountain guide for the next couple of days, Libby Peter. First on the day’s agenda was an extensive, highly informative DMM factory tour. It really is staggering just how much time and how many processes go into making something which looks as simple as a carabiner! After the tour, we headed back to get all kitted out for an afternoon of climbing. The destination of choice was Castle Inn Quarry. We climbed various sport routes between the group, from 5a to 6c+. For those of you who don’t know Libby, she is one of the most highly respected climbing improvement gurus in the UK, so needless to say she was on-hand to dish out training, tips and advice, and ultimately to make sure that everyone was climbing safely. By 7pm we were all thoroughly exhausted and ready for a good curry! We winded back to Llanberis via the Pass, which has some of the most outstanding landscapes you can possibly hope for only a few hours out of London. We checked in at the Dol Peris guesthouse and moved to the local curry house to meet up with the others for brilliantly tasty food, some epic stories and invaluable climbing advice. We checked out and headed over to the best local breakfast spot for any hungry climber, Pete’s Eats, for fry ups and pints of tea all-round to stock up for the day ahead. Although the weather in Llanberis was pretty off-putting (you know that kind of rain which somehow manages to come at you from the side? ), Libby assured us that she knew a spot which would be dry and offer bouldering as well as some sea cliffs climbs. As if we ever doubted Libby’s local knowledge! We arrived at the Marine Drive Toll Road on the Great Orme headland and parked up in front of the famous Parisella’s Cave. After a few moments admiring the geography and the sheer difficulty of the bouldering routes, we swiftly moved off to the nearby Split infinity Cave and started to warm up. We spent a couple of hours negotiating some of the bouldering problems and watched some outstanding performances from the guys from our stores. A short drive further up Great Orme, we then followed Libby down to the cliff edge where we made camp and set up an abseiling point to rappel down and onto a ledge towards the bottom. Tim swiftly descended first, followed by the rest of us. The more experienced climbers among us put in a few trad routes while some of us took lessons in placing gear to climb our first trad route! Once we reached the top, it was time to pack up and head back to London…boo! It was an absolutely amazing couple of days with some really knowledgeable and talented people and everyone who attended came away with an abundance of new skills! The Arc’teryx Squamish Hood Jacket (pictured) is super lightweight, packable and really works if you need that extra layer to take the bite out of the wind. Tom and I used the Arc’teryx Alpha FL Jacket once we got onto the sea cliff. The main purpose of this was to test breathability. The sun really hit me on my accent, but I didn’t feel like I was overheating at all! I had the Arc’teryx R320A while everyone else used the Arc’teryx AR395. The general consensus was that if you don’t ever notice the harness, it does its job well! It’s super comfy and the new technology really keeps the weight down. We were all given two pairs of La Sportiva rock shoes: the Katana (pictured) is less aggressive, more comfortable and more appropriate for longer routes, while the Solution has a more aggressive shape and is brilliant for technical bouldering and shorter routes. I was the only person to test the Arc’teryx Acrux approach shoe. The first thing you notice when you put them on is the Adaptive Fit. Walking on a sea cliff, you really need to be able to trust the grip on your approach shoe as well, and I certainly found it here! Check out our full review of the Arc’teryx Acrux. All of the hardware that we used was DMM, from the Alpha Trad QD to the Dragon Cams and new Pivot belay device (pictured). 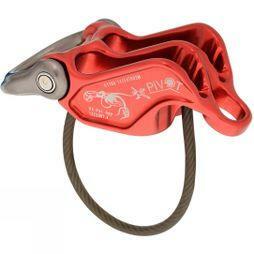 The Pivot is an extremely clever piece of kit which makes an otherwise difficult task easier. I also really like how you can lengthen and shorten the slings on the cams and nuts. It was really great to use trad gear and be shown how to place and remove it properly.